The most comprehensive and integrated package for every music theory classroom. The anthology includes over 100 outstanding teaching pieces written between the seventeenth century and the present. These scores constitute the text’s core repertoire; with the text’s spiral-learning method, students return to each work throughout the theory sequence. The selections represent a wide variety of genres and instruments to engage every student. For the Third Edition, the anthology has been expanded to include more works from the recent past. The best way to integrate music theory and aural skills just got better. Reorganized for ease of use, The Musician’s Guide to Aural Skills features chapters that correspond with The Musician’s Guide to Theory and Analysis; within each chapter, activities are carefully sequenced for an ideal pedagogical progression. Throughout, the text emphasizes connections to written theory, so that both sides of the theory curriculum are mutually reinforcing. 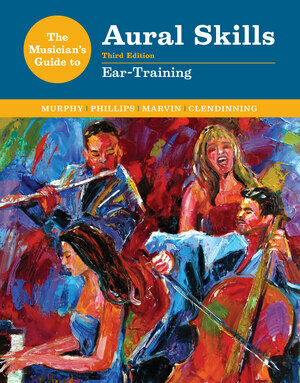 The Musician’s Guide to Aural Skills consists of two volumes that can be used together or on their own, providing resources for the entire aural skills sequence—from fundamentals to post-tonal ear training. Together, the two volumes contain everything students need to succeed. The sight-singing volume is carefully sequenced to coordinate with The Musician’s Guide to Theory and Analysis. Every chapter now begins with an outline of learning objectives, so that students know what to focus on and instructors can easily locate exercises that develop a particular skill. Hundreds of short, self-grading Try it dictations that help students identify common musical gestures. The ear-training volume includes over 400 contextual-listening activities that guide students through dictated-recordings of real music. With so many exercises--all tagged with learning objectives and difficulty levels--instructors have the flexibility to select exactly the activities their students need. The Third Edition highlights the relevance of aural skills to students’ lives as musicians through a rich variety of classical, folk, and popular music, including works that students know and perform. The sight-singing text features a range of melodies from the literature, as well as improvisation and composition exercises. Contextual-listening activities feature real music— recorded by real performers—so that students learn to take dictation from authentic musical contexts, rather than artificial exercises. The Musician’s Guide Series is the only complete package that coordinates written theory and aural skills. Throughout the series, the presentation and ordering of topics correspond so that written theory and aural skills are mutually reinforcing. Instructors can mix and match the resources that are most appropriate for their classes.